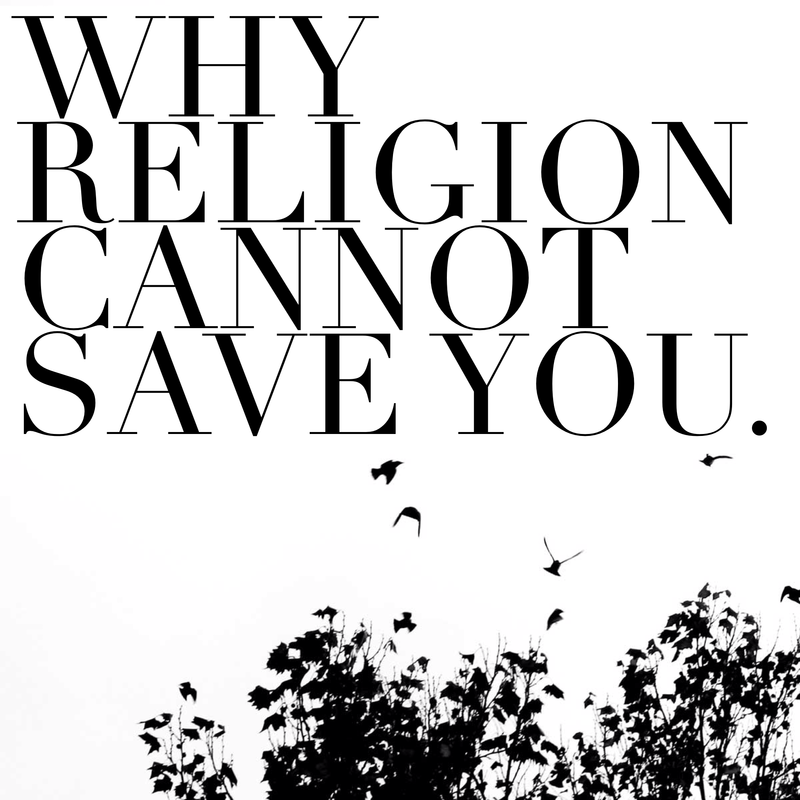 Why Religion Cannot Save You. I believe that the beautiful gems in this world have known suffering and loss, and have found their way from the depths. In our moments of brokenness, we wrestle with everything we’ve ever known, and only then can we find a peace that surpasses all understanding. Healthy, beautiful people don’t just happen by accident. But it is in the miracles of life that we find ourselves with appreciation, empathy, love, and compassion. I am going to preface the rest of this article by saying that I am here as a writer to speak my truth and communicate with love and authenticity. We may not have all of the same beliefs and opinions, but I truly know that our purpose can be shared. Nothing I say is to intentionally offend anyone, but I refuse to live in hiding, and will share what is on my heart. I received many messages yesterday after my blog article (and I can’t thank you all enough for taking the time to read, support, and even message me). While many people said some similar things, there was one message that really stood out. Joann said it was okay for me to share her thoughts and question, and I am going to do so, because she is not alone. So many women had the exact same concern, which made me realize it’s time for the dialogue to continue. I chose Joann because she used the word religion. Thank you so much for the courage it takes for you to share your process with us all. Your vulnerability and honesty is a much needed voice in this world. I guess where I’m stumbling is that, as a mother, I like to think that it’s in my power to love my children enough that it protects them from being hurt, or could at least provide a cushion and safe landing when times are tough. I know you are a godly woman, and I also know how much you are hurting, as you have been so gracious to share authentically. I was wondering what your thoughts were on religion. Is it really enough to save us from the destruction in this world? Keep writing. We need you. The short answer (though I will elaborate and rant) is no. Religion alone (adherence to the beliefs and practices of a religion in the hope that your performance will gain you right standing with God) cannot save you. No matter what the religion is, following a set of practices and rules does not guarantee a perfect or easy life. If we are speaking biblically, the gospels make it incredibly clear that the most challenging people to reach with the are not the ones who completely deny God or choose wicked ways, but actually the open and outwardly religious. There are various accounts of corrupt tax collectors and immoral people coming to a place of accepting God and living in grace. These people acknowledged their need for growth, had a desire and heart for change, and knew that they couldn’t do it alone. However, it was the religious that opposed Jesus and essentially nailed him to the cross. Blinded by pride, their tainted ideas of “religion” caused darkness and destruction. Regardless of what your personal journey is with faith, no matter what you believe in, let’s take a moment to consider the story of Jesus. This man’s mission wasn’t about promoting religion. Religious activities didn’t impress him. He wasn’t applauding phony culturally Christian attempts. Those who are purely religion-driven deceive themselves by thinking that their outward rituals and rules will impress God, while at the same time they dodge dealing with the pain that is in their hearts. Our good deeds and Christian checklists won’t save us. I’m going to say something you’re not going to like, and as a recovering perfectionist, I don’t like it much either. But it’s the truth. With the best of intentions, life still happens. And sometimes, it hurts. Religion cannot save you from the realities and heartbreaks of this world. Some things, many things, actually, are out of our hands. But the great news is, the world is not religion. Faith is not religion. Jesus is not religion. We are not religion. RELIGION told me that if I prayed hard enough, my physical illnesses would be cured. RELIGION told me that if I just followed the rules and did everything “right” according to their cultural laws, my marriage couldn’t fail. RELIGION told me that if I was still sick, I must not have really believed hard enough. RELIGION told me that if I donated enough money, I would be financially blessed and always taken care of. Faith is about more than yourself. If you believe what you believe purely out of hoping it helps you fit in, reconsider. If you’re going to church solely out of obligation, take a break. If you are only giving out of guilt, stop. If you stifle your true identity to fit into a bubble, quit. Now. You can’t have the depth you desire if you’re stuck in a cage. You were designed to be free. And if you live calling yourself a follower of Jesus, his mission was this radical grace and freedom. Be yourself. You can handle it. God can handle it. Religion, though, cannot. Religion won’t tolerate it. Religion is the manipulative, abusive boyfriend who pushes you and drives you to make choices you’re uncertain about by filling you with fear. You’ll never live up to religion’s impossible unrealistic standards. But I have good news: we weren’t designed to. God’s grace is so much more powerful of a motivator than fear. Love is the deepest motivator. Only love can produce not only willing obedience but also lasting obedience. If you are being motivated by fear, rules, anger, or some other emotion, it usually only lasts while that emotion is there. Love, being a state of the heart, lasts even past the initial emotion. Love is greater than religion. I don’t need to see your religion. I need to see how you live. I need to see how you love (yourself and others). Previous postSweet William: The special new man in my life. Creative artists will confirm the truth of what you say; often through pain and suffering comes creativity. There are those who say we need to eliminate all pain and sickness , emotional and physical. Nonsense. How would Beethoven have composed if he never went deaf? To make everyones lives a bed of roses would stifle character growth. Thank you so much for taking the time out of your day to read my article and engage in this dialogue. I really love what you said about creativity coming from the pain and suffering. I wholeheartedly believe that our best art is when we create beauty from the ashes. Keep it up, and enjoy the journey. I’m 74 and retired by the sea in the south of England so I have more time than most. Thankyou for your reply.